Which style formula and method do you use and recommend? Shocked you'd think we were anything but fashionable. I make a homeopathic loaf with 10000000000% hydration, and fold it like z^2+c. But when I bake (which like AB I'm less likely to with Bageri, Bakeri, Bien Cuit, etc. 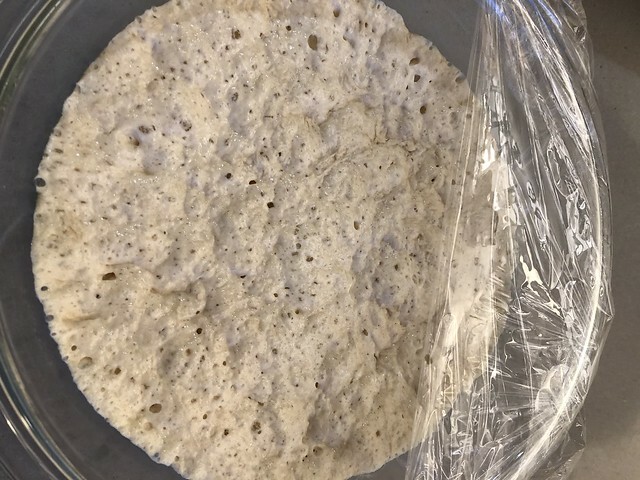 available) it's usually 50% rye (with the other half usually bread flour, occasionally some spelt although that usually turns out pretty flat), 65%-ish hydration sourdough, or if it's focaccia and such then I use hoshino yeast and take maybe 2 days in the vegetable drawer to ferment. I try to only buy bread from places with names that start with a "B." Although an "M" and a "P" work as well. I am trying a first experiment with the new oven, baking steel, and fairly high hydration, no-knead (no fold, either), yeasted flat bread - via Lahey's pizza bianca recipe. After its initial 12-hour ferment, it looks good...and now it's folded, shaped, and in the fridge. I've been finding that when I use the Lahey method my loaves turn out to be as dense as hockey pucks. No, no, no!!! Not my experience. I use the original formula, adjust flours and additives (seeds, nuts, dried fruits, seaweed), let rise overnight, sometimes adjust and extend second rise. I judge when it is ready to bake by its shape and bounce. These loaves are better than I can locally at $6 plus. So my pizza bianca, hewing to the Lahey method, wasn't as good as the ones we ate daily in Rome (big surprise). The surprise was that it wasn't as good as other attempts I myself have made. Too bad I never write stuff down - like the formula I followed when I made some delicious ones. Interesting. Am sorry since I've been waiting to read your results. Focaccia is so different from pizza bianca though. The best focaccia Ive made was following a recipe in the Il Fornaio bread book. Uses a biga. Always came out great. Doesn't the Italian recipe call for brewer's yeast and 00 flour? I don't know if there's a singular Italian recipe, but all the books (including a few specific Roman cookbooks) I've referred to call for active dry yeast, and bread and/or a/p flour. Are those cookbooks that have been Americanized by the publisher? Or actual Roman cookbooks, in Italian? I ask because Americanizations sometimes change ingredients from those in the original recipe to something more easily obtained in the US. Which is not to say that the recipes are retested; afaik, only Fred Plotkin tests his recipes both ways.